I'm staying up late hoping to see some Aurora Borealis display. It was forecast that there will be a good display tonight due to coronal holes. I don't know how good the display from downtown Fairbanks though since there's a lot of lights around. I wish I'm up somewhere away from the city lights and I wish I have a better camera to use so I can take some good pictures. The best Aurora Borealis display I've ever seen was the one in Valdez, Alaska in 2001. It was very colorful almost looks like blood in the sky. I felt bad and sad that I didn't get to take pictures of it. 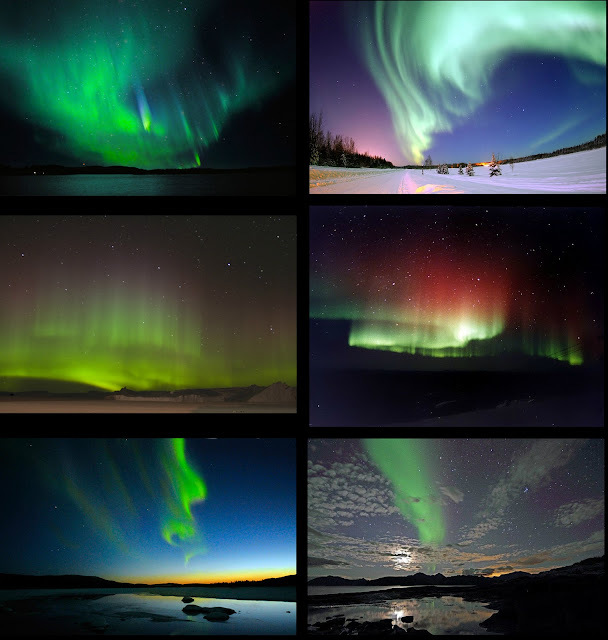 Anyway, here are some Aurora Borealis pictures from Wikipedia. Now that is something that I need to see...on my bucket list. in the last few weeks we have had some beautiful aurora borealis display. I wish you guys could see it.